Built in MODEM providing internet service on the move! An excellent built-in SAT NAV, SNIPE Satellite Antenna, Reversing camera , Fiamma canopy, Dometic Air Conditioning and heating unit, Electric Step, Mirror Guards, Truma Heating, USB Charging Point, Flatscreen TV with DVD. CD Radio. Drop-in carpets. Fly Screens and full blackout blinds. SOG toilet extractor. Global telemetrics CAT5 tracker, Self Refillable LPG Gas System with all euro LPG gas connectors. Thule lockable bike rack for 3 bikes. 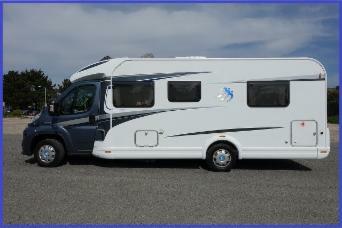 A lovely well kept motorhome only used by 2 adults with no children or pets. Knaus SUN Ti, used Habitation Window in very good condition. Please contact Paul on 07766190832 for any help or advice that I maybe able to offer. I have one which does not roll down at the front (fixed design) for £20 and two available which do roll down at the front on offer for £40 each. All three are in good condition and have been owned by myself or my close family members who have asked me to sell on their behalf. Postage will be extra, I can get quotes or we can arrange to get you them by meeting up etc etc.